Hi there, I'm new to this but enjoying it. Am trying to do a moss stitch on a 29 cast on and it seems to just look like a rib. Where am I going wrong??? At a guess I would say that you are not alternating the stitches with each second row. 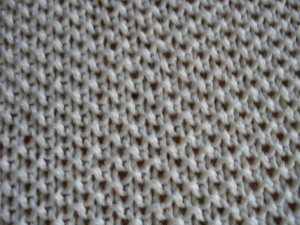 Moss stitch uses the same basic stitch pattern as a 1 x 1 rib which is k1, p1. When you are knitting rib, you knit all stitches where you done a knit stitch in the rows below and you purl the ones that have been purl stitches in the rows below and you get nice vertical lines of knit stitches separated by grooves in the fabric created by the vertical lines of purl stitches. In moss stitch you have an alternating pattern so that each vertical line is 1 knit stitches followed by 1 purl stitch (repeated up the knitting).